For decades, activists and affected communities in Congo have called attention to the links between their country’s minerals and its protracted armed conflicts. To many communities historically impacted by the violence and lawlessness surrounding Congo’s gold, tin, tungsten, and tantalum mines, the need for change is clear. As a result of the unique leverage they have over their supply chains, the multinational companies that profit from Congo’s minerals have a central role to play in addressing the links between conflict and mining. 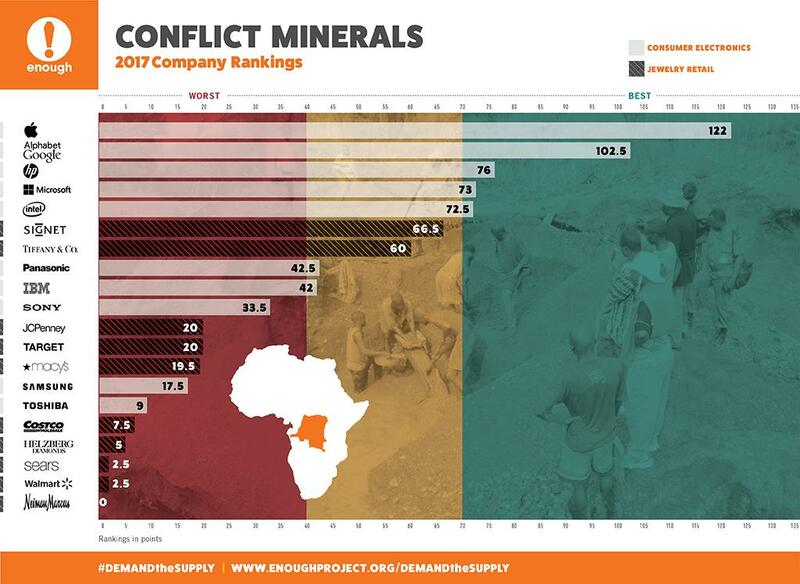 The 2017 conflict minerals company rankings examine 20 of the largest companies, as defined by market capitalization, in two of the industries which consume the most tin, tungsten, tantalum, and gold: consumer electronics and jewelry retail. Although a range of industries use these minerals—often referred to as conflict minerals or 3TG—Enough chose to rank these two industries in particular because they have demonstrated the potential to be catalytic in the development of new policies and practices regarding responsible sourcing, and they are also particularly attuned to consumer pressure. These latest rankings acknowledge the steady advances that have been made since Enough conducted its first company rankings in 2010 and expose the considerable and urgent need for more action. A higher score indicates the company is making more progress on sourcing conflict-free minerals from Congo, while a lower score indicates little or no progress. The colored backgrounds in the graphic also break up the companies into tiers – ‘green’ being the best grouping ‘yellow’ in the middle, and ‘red’ the worst. Learn more about how companies were scored in the company response annex. Apple Inc. emerged as the clear leader, scoring 114 out of a possible 120 points, plus an additional eight points in extra credit. Although even a perfect score would not mean a company has no more work to do, Apple’s consistent fulfillment of the rankings criteria indicates the company has committed substantial resources to developing processes for sourcing minerals from mines that benefit Congolese communities. Alphabet Inc., Google LLC’s parent company, ranks second overall, even though the company was not included in Enough’s 2012 rankings because at the time they were not manufacturing consumer products containing 3TG minerals. HP Inc., Microsoft Corp., and Intel Corp. round out the top five companies with scores ranging from 72.5-76 points. After that group, the electronics companies take a steep dive, with the next closest company, Panasonic Corp., only scoring 42.5 points and the lowest ranked electronics company, Toshiba Corp., at nine points. And while Signet Jewelers Limited and Tiffany & Co. lead the pack in the jewelry retail industry with 66.5 and 60 points respectively, companies from this industry generally lag far behind, with the remaining eight jewelry retailers scoring between zero and 20 points. Years of pressure from Congolese civil society and international consumers, student activism, legislative action, multistakeholder and trade association contributions, and corporate leadership have begun to turn the tide in Congo’s 3TG sector, where legal, conflict-free mining is starting to become more prevalent, offering benefits to many miners and mining communities. But major gaps in improvement remain and new challenges have arisen. Corporate transparency broadly, and the U.S. Securities and Exchange Commission Conflict Minerals Rule in particular, are under attack. Congo faces a constitutional crisis which could be further exacerbated by a resurgence of conflict mineral financing for armed groups. In order to maintain positive momentum, companies, civil society, consumers, and policymakers should continue to undermine the profit motives underlying Congo’s violence, and collaborate to support the development of thriving, diverse local economies and transparent global minerals supply chains. Improve and support public reporting on supply chain due diligence. Conduct continuous due diligence, not just annual reporting. Engage in multistakeholder initiatives to design and support progressive initiatives. Support conflict-free sourcing opportunities and livelihood opportunities in mining communities with financial investment and public support. Set the bar higher by assessing and mitigating risks including paying specific attention to mining in national parks and engaging with financial institutions on conflict minerals due diligence. Download the company response annex in Excel here. View the company response annex in Google Docs here. View Enough’s 2012 electronics company rankings here. View Enough’s 2014 jewelry leaders review here.